Nikon | Imaging Products | Best of the Rest / Nikon Family Cousins, Part 12 : "Nikon FG / FG20"
Home > Products & Support > Imaging Products > History > Camera Chronicle > Part 12 : "Nikon FG / FG20"
Part 12 : "Nikon FG / FG20"
It was in May 1982 that Nippon Kogaku K.K. released the Nikon FG (see photograph) which incorporated a programmed AE for the first time among its SLR's. It was the start of the history of multi-mode AE SLR of Nikon, but before that there was a hidden long way. The Nikon FE (Part 10. of this series) was released in April 1978, which was loved by many fans as a standard of aperture-priority SLR. In the same month, Canon A-1 was released, and it started the age of the full-scale SLR with a programmed AE. Canon AE-1 PROGRAM (Apr. 1981) and Minolta X-700 (Oct. 1981) followed, and the direction for the programmed SLR became quite sure. It seemed to be a natural course for the SLR to be used by as many people as possible, but there was quite a difficult technical problem. In order to realize a programmed AE, it is innevitable to control the aperture stop of the lens from the camera body and it is the problem how to realize that with many Nikkor lenses accumulated since the old age of the Nikon F.
With the combination of Nikon F2 Photomic S + EE Control Unit DS-11 (photo left) and Nikon F2 Photomic AS + EE Control Unit DS-12, the method of rotating the aperture ring of a lens direct with a servomotor was adopted. However, this seemed difficult to equip with the FG since it would make the mechanism too elaborate. After all, almost only method left to control the aperture stop from the body was to move the automatic aperture control coupling lever which was equipped with every lens. 2.) when pushed down by the power of a spring, it stops down to the aperture value fixed by the aperture ring, but isn't considered about the situation that the movement of the lever is stopped on its way of the stroke. Therefore, even when this lever is stopped moving at the same position on the way of its stroke, it differs at every lens, to what extent the aperture stop blades are stopped down. In many cases, at about the position two(2) steps stopped down, the stroke of the coupling lever reaches about the half way, and in the stopped down region (e.g. f/16 or f/22) the movement of the lever becomes very small. Such being the case, it is difficult to control the aperture by using the stop down coupling lever. Particularly, in the stopped down region, as a very small movement of the lever should be controlled, it would be difficult to insure accuracy. So Nippon Kogaku started to standardize the movement of coupling lever to prepare beforehand for the days of multi-mode AE to come. "AI-S Nikkor" lens was it (This naming is used only in Japan (Nippon). By the way, in Japan, among AI Nikkor lenses, "AI-S" type lenses are distinguished from others in that the smallest stop (i.e. the largest numeral) both in the aperture ring and the view finder indication is colored orange). 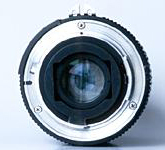 In the "AI-S" lens, a lot of new functions are included along with the movement of the coupling lever modified to proportionate approximately to the number of steps of stop down; they are the full open aperture value of the lens, the information on focal length and the discriminating information from conventional lenses. It was early spring of 1980 when "AI-S Nikkor" lenses were put on the market, but the fact is that the same mechanism was incorporated in another lens series. 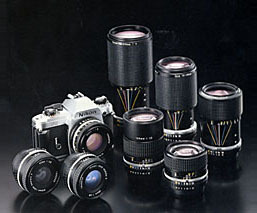 Yes, Nikon Series E lenses (see photograph) were they, which were put on sale at the same time as the Nikon EM (See part 11.). As soon as they were announced at the "PMA" convention in the spring of 1979, quick-sighted people noticed the difference between them and the AI lenses and it was talked about here and there : "What is this boss on the protection ring of the rear of the lens ? ", "What is this cave in the mount ?" As Nippon Kogaku K.K. didn't give any particular comments and kept silent, many guesses appeared in articles of camera magazines. Looking them back now, most guesses were right, but there seemed to be no one who investigated the relation between the aperture stop and the movement of the automatic aperture coupling lever. Anyway, the preparation for the automatic aperture stop control had already been stepped silently three years before the release of the Nikon FG. On the other hand, the development of the mechanism of aperture stop control was set about at the same period. 2.) the intention for controlling non "AI-S" type lenses to a certain extent. As a matter of fact, it has an advantage of getting an accurate exposure, since it is made to control the shutter speed based on the metered value, by metering again after controlling the aperture stop. 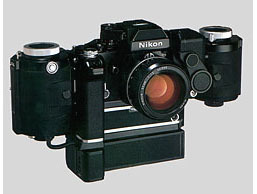 At the beginning, the development of the aperture stop control started, based on the mechanism of the Nikon EM (see part 11.) --- that was in 1978. Later, the project to incorporate the stop control into the Nikon FE type mechanism and both developments were proceeded in parallel. 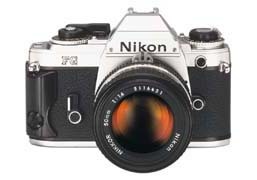 The former was realized in the Nikon FG, while the latter in the Nikon FA (1983). This instant stop-down metering first watches the amount of light from the subject by the metering circuit after starting the stop-down action and then stop the stopping-down on its way by giving a signal when the light value comes to the fixed one, therefore the reflex mirror cannot be flipped up until the aperture stop control is completed ; consequently the delay from pressing the release button to the actual shooting becomes, in principle, rather long. Besides, it has a drawback that the influence of the incident light through the eyepiece is relatively large, as it adjusts the shutter speed based on the metered value at the stopped down position. Since then, due to the technological advancement, an accurate aperture stop control has become possible without the feed back from the metering circuit, and the aperture stop control by this instant stop-down metering was lastly incorporated in the Nikon F-501 (Apr. 1986) and was switched to the present full aperture metering system. The FG was ranked between the Nikon EM and the Nikon FE in the selection of Nikon cameras at that time. While the camera body basically succeeded that of the EM, it incorporated such versatile functions, in addition to the aperture priority AE, as the manual shutter and the programmed AE, and the TTL flash control which are even superior to the higher class model FE. But the aperture stop preview and the aperture direct-readout indication were omitted to keep the distance from the FE. The interesting thing is that the "sash" was revived, which was omitted from the EM. When I interviewed the designer in charge of the EM, to write the article of the previous part (part 11. ), I heard the phrase "EM without a sash" repeatedly. This "sash" means the black-painted part between the leather trim and the top and the bottom cover. This part seemed to be a symbol of the high class model from the standpoint of the good looks. Actually, the painting of this part took much process time and was a cause of lowering the rate of acceptance because it was a subject of the appearance inspection. In the cost-priority EM, this 'sash' was omitted, and the part of the plastic top and bottom cover bordering the leather was made a step higher so that it looked like a "sash". The "sash" came back to the FG (see photograph). It seemed that the FG should have been given a higher model image than the EM. However, looking at the present selection of Nikon SLR's, all the high-grade models including the F5 have no "sash". Instead, 'sash' remains in FM10 and the FE10 which are MF (Manual Focus) lower-grade models. The standard of high-grade model seems to change with the times. This issue first appeared in "Nikkor Club Quarterly" magazine, published by the Nikkor Club, and was revised for Nikon's webpage.